Dropbox has announced two new versions of Mailbox: one for Android, available now, and one for desktop that's currently in beta. It's been over a year since Dropbox purchased Mailbox, a previously iOS-exclusive app that is meant to make sorting through emails intuitive and simple. At the time Dropbox said it would leave Mailbox alone, opting to let it stand on its own and help it grow rather than folding it into Dropbox. With Mailbox's launch on Android and its impending release on desktop, Dropbox is looking to keep that promise. In addition to throwing away, saving and organizing your email into lists, the app includes a new feature called auto-swipe that lets it automatically archive certain types of emails, like spam or marketing messages. The app's official site says it "learns from your swipes and snoozes to automate common actions," essentially figuring out what kind of mail you read and what you save and trash over time. The need to expand to Android and desktop seems a logical step for an app that Dropbox claimed has 275 million users. For its time-saving prowess, the app isn't fully featured yet. According to its Google Play description, Mailbox for Android currently only works for Gmail and iCloud accounts. Dropbox made the announcements at a presser in San Francisco, where it also revealed a new cloud collaboration service called Project Harmony that will make Microsoft Word, Excel and Powerpoint more like Google Docs as well as the Carousel photo and video app. 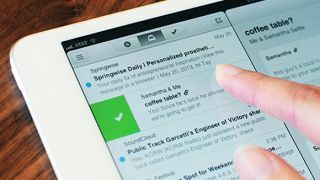 Mailbox uses intuitive gestures on iOS and now Android to help users deal with emails quickly. On desktop it employs similar gestures for users with a trackpad. You can sign up for the Mailbox desktop beta on the app's official site or download the Android app now.